Things you can make and share. As I write this post, it is -13 degrees outside with a wind chill of 32 degrees BELOW zero. I am hunkered in and very grateful for a warm house and the ability to stay in it today. A friend was here visiting my boys this weekend and was going back home to Ohio which is under the same deep freeze. He told me his apartment heater can’t keep up when temperatures go below freezing much less below zero. I reached in my basket of rice bags and sent one home with him with instructions on how to use it. Our rice bag basket – note the mateless toddler sock on top. Probably about 15 years ago a little girl that was over at our house told me her mom gave her a rice bag when her tummy hurt. She then proceeded to describe it to me and I MAY have made my first rice bag that very night, or at least very shortly thereafter. It’s a very simple project. Sew together two rectangles of COTTON fabric (Cotton doesn’t melt.) Fill it about ¾ full of rice and stitch it shut. Microwave this lovey for 2-5 minutes depending on its size. Now, tuck it in your sheets, lay it on your lap, wrap it around your neck, use it wherever it’s needed. 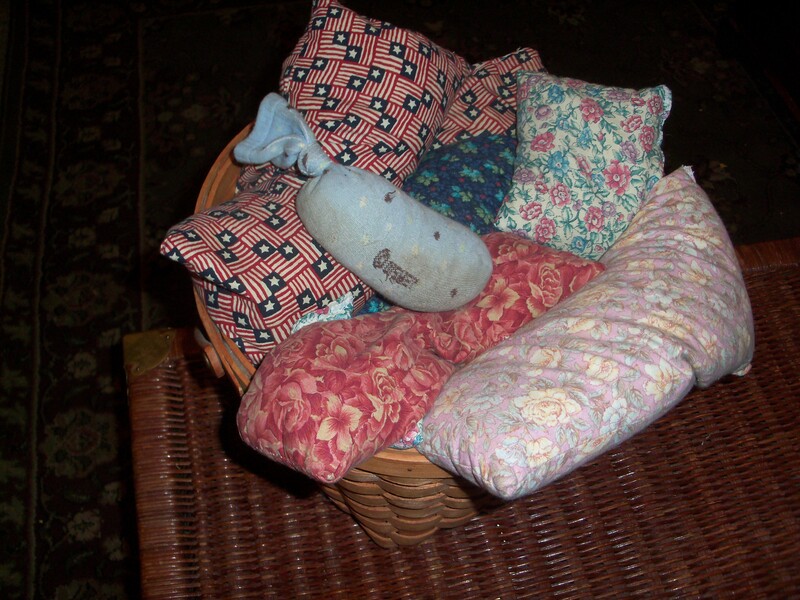 A 7” x 10” bag heated for 4-5 minutes and tucked under blankets will hold heat for several hours. It is incredibly comforting to sore tummies and sore muscles. When you get those way over-tired chills that nothing short of a hot bath will get rid of, a warm rice bag will chase them away. I’ve made them square, rectangular, long and snaky (great for necks) and in a pinch, I’ve even filled a cotton sock with rice and tied it shut. Many years after I’d started making rice bags for my family, a friend introduced me to the DELUXE version. A rice PAD filled with rice, but sewn in little squares and with cloves and allspice berries sprinkled in the rice. I’m very possessive of my rice pad. They are a little more difficult to make, but still not too hard. A nice size is about 15” x 18”. 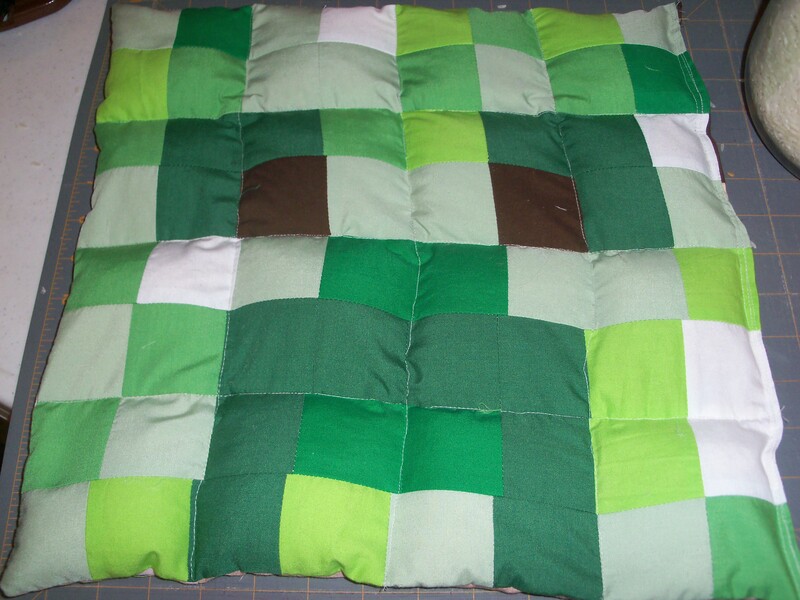 Here are pictures of a two-faced rice pad I made for my Minecraft-loving great-nephew this past Christmas. 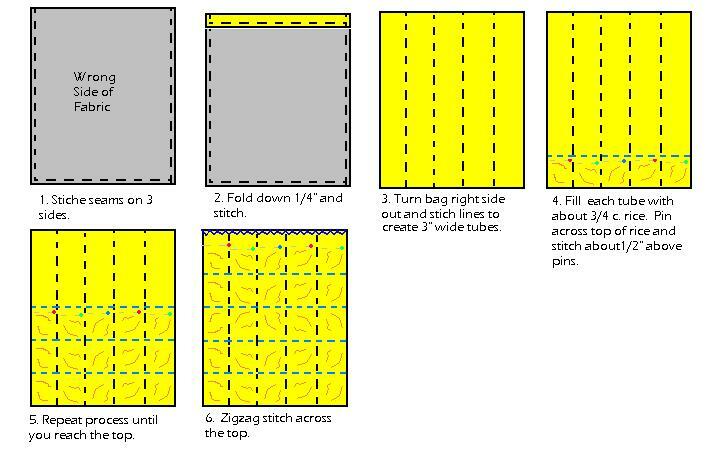 Sew two pieces of fabric together around 3 sides. Turn down ¼” of top (unstitched side) and stitch edge. Turn bag right side out then sew columns about every 3 inches. 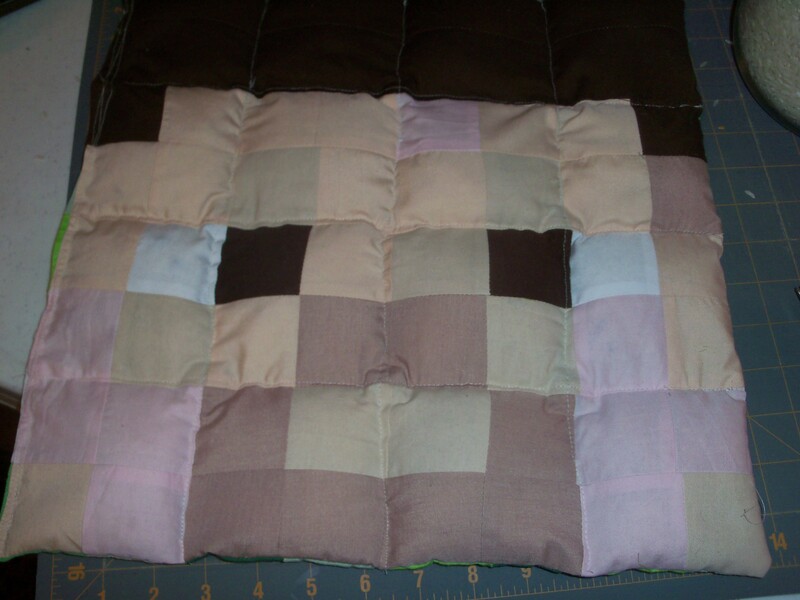 Now make a line of stitching about ½” above the pins. Repeat the process until you reach the top of your tubes. We have used heated rice bags in our cooler to help keep hot dishes hot. Works great! I have been known to put a hot rice pad beneath platters of food on the table to keep the food warm. Rice bags make great gifts! Whether you make a rice bag, a rice pad or a rice sock, I hope you give this a try. Let me know what you think. Stay warm and cozy this winter.